On a reader's recommendation (Steve), I ordered some peony seeds from Ali Express. 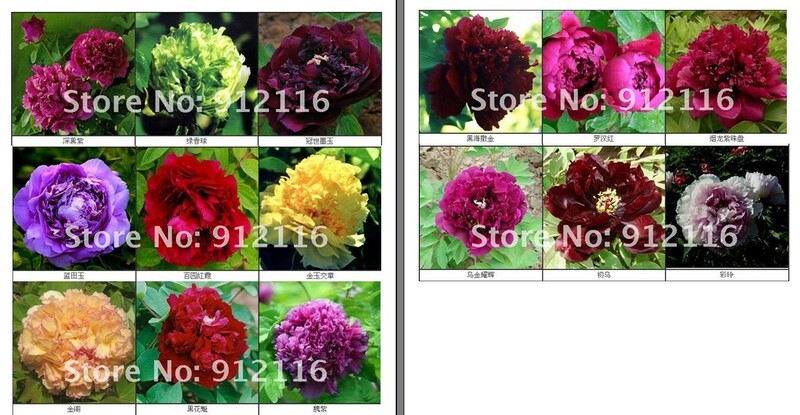 I wanted a nice mixture, and one of the sellers, Linlang Department Store, offered seeds from 15 named tree peony varieties (Chinese names, of course) of all different colors. So I decided to order from them. They weren't 4 cents a seed, but I'm hoping for some nice seedlings. They ended up being 12 cents a seed for 100 seeds, so $12. I also ordered a pack of mixed color seeds, no named varieties, off of Ebay for $2.50 for 120 seeds. That's about 2 cents a seed. Who knows what I would do with all of those plants if they actually came up? Tree peonies aren't even my favorite anyway, but for more than 200 p. suffruticosa seeds for less than the price of one herbaceous peony root, I figured I'd give them a try. I'm sure not all of the peony seeds will come up anyway, but this gives me a nice chance of actually getting some plants and the opportunity to see how these Chinese tree peonies will adapt to and grow in my southern climate. I just noticed that either 120 or 80 bid seed bid, and I've been trying to get one of those myself, but I've been unsuccessful in winning them so far. Thanks for the tip. I really hope aliexpress seeds are viable. I know that eBay seeds sometimes take 2 years to germinate from direct sowing. One of the problems that I have run into is that if they aren't planted deep enough, squirrels will dig them up and eat them, or pill bugs can also eat them as they sprout their roots in the fall. Steve, your welcome! I just submitted a best offer of $2.50 for the 120 seeds auction on Ebay, and it was accepted. I hope you can get some cheap p. suffruticosa seeds too! I bidded on it for 2.50, and got the auction so I guess I'll have even more seedlings in the future. I already have lots of seedlings going of all different kinds, but they really don't require any care so I just keep them weeded, and let them grow because some day they will flower and have lots of surprises. In the mean time, I will have to look into getting some fern leaf species as well as anything that looks very unique. I will looking forward to receiving my lutea Tibetian tree peony in another month which is a giant form with lots of relatively small yellow flowers. Steve, that's awesome! I can't wait to see how the seeds turn out and compare notes. Yes, I am still trying to coax a bloom out of a fern leaf peony here. I have gotten some of the fern leaf hybrids to bloom, but not the species yet. I am experimenting with a different location that has less sun and more moisture to see if that will help it. I tried growing a P. lutea hybrid once, but it did not survive. I didn't baby it, though. I guess if I try again, I will have to baby it next time!